The owner of a "kleptomaniac cat" which last year stole neighbours' Christmas decorations says she is disappointed with this year's haul. 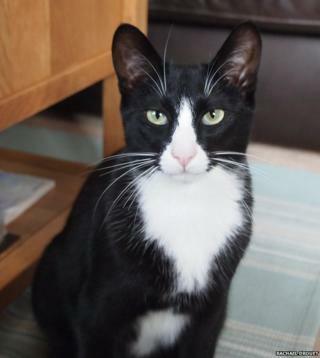 Rachael Drouet's cat Theo is a well-known criminal who uses cat flaps to enter homes in Ipswich, Suffolk. But she had to buy her own decorations for Christmas 2014 - because her cat burglar has only stolen one. However, Theo has not lost the thieving bug entirely. Miss Drouet has been busy returning stolen baby clothes and toys. Last year, the three-year-old Siamese cross's Christmas spirit was far more pronounced, Miss Drouet said. She believes he was getting into other people's homes and taking decorations from their trees before bringing them home to her. Some of the owners of the slightly mauled items were never traced. This year, the real-life cat burglar has brought home just one decoration. "As a result our Christmas tree is looking rather empty," Miss Drouet said. "The roll-call of his booty this year includes lots of items stolen from builders who have been working nearby and a baby's bib and painting smock. "The bib was personalised and clearly loved. I posted it back through the letterbox as it was too embarrassing to have the conversation with the parents." A large rubber dart has been Theo's most "impressive" acquisition, his owner said. "The dart was quite big and not an easy thing to carry around," she added. "It's quite possibly something the builders were using to try to shoot Theo and stop him getting in their van." What makes a cat burgle? Miss Drouet believes some of Theo's efforts have been thwarted after neighbours became aware of his antics and fitted new cat flaps that only recognise their own pets' microchips. "Theo is following the typical behaviour shown by hardened criminals, getting braver, thieving closer to home and getting sloppy about covering his tracks," she said. However, he has shown no sign of giving up his thieving ways. When Miss Drouet moved her fridge she discovered the extent of Theo's crimes and his favourite hiding place. A pile of items had "found their way" underneath the appliance. More recently Theo has taken a fancy to empty charity bags left in the hope people will donate unwanted clothes and other items. "Actually, we've had about four of these," Miss Drouet said. "I think it shows that whilst Theo is a thief, he also has an incredibly generous, giving side. "Perhaps he is planning to fill them with all the items he's been 'finding'."